Since the super fun food trip to Penang last year, I knew I had to bring my parents here! This year, we decide to visit Penang on 7th July for George Town Heritage Festival. I’m glad we did so! It was so fun! Other than attending the festival, my parents get to try lots of good food in Penang! & i meant ALOT! 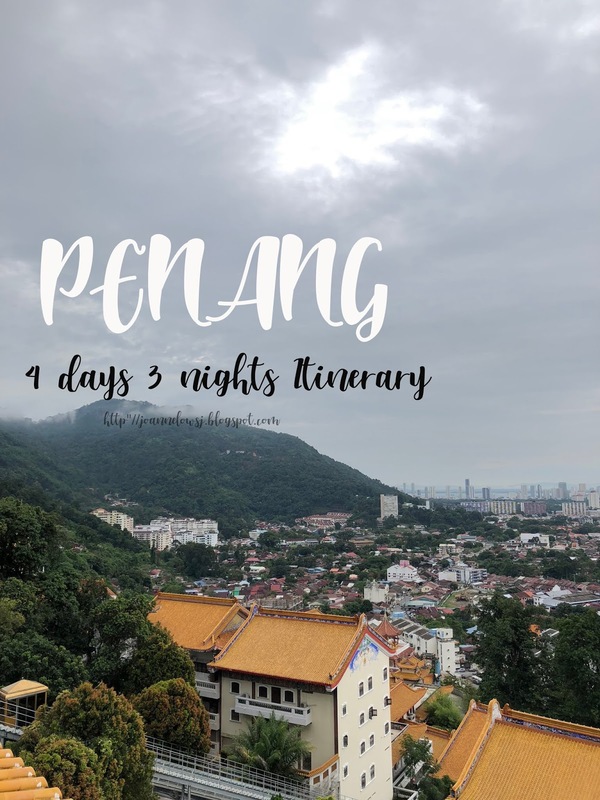 If this is your first time to Penang, Read the things to know before visiting Penang here! Otherwise, continue to read and check out the updated list in this itinerary! We eat a lot more this round! Here’s what we did and eat! An hour flight from Singapore to Penang, we bought our tickets when it was on sale for $139 with Silkair. Even before we set off, the food trip started with TCM Lounge and SATS Lounge in Singapore Changi Airport. 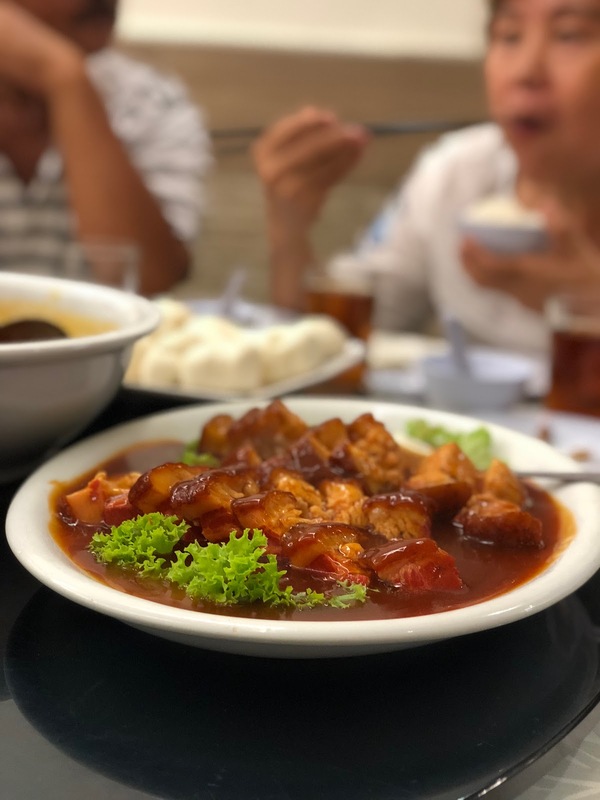 After we check into the hotel, we went to Lebuh Kimberly Street for the famous Duck Kway Chap! 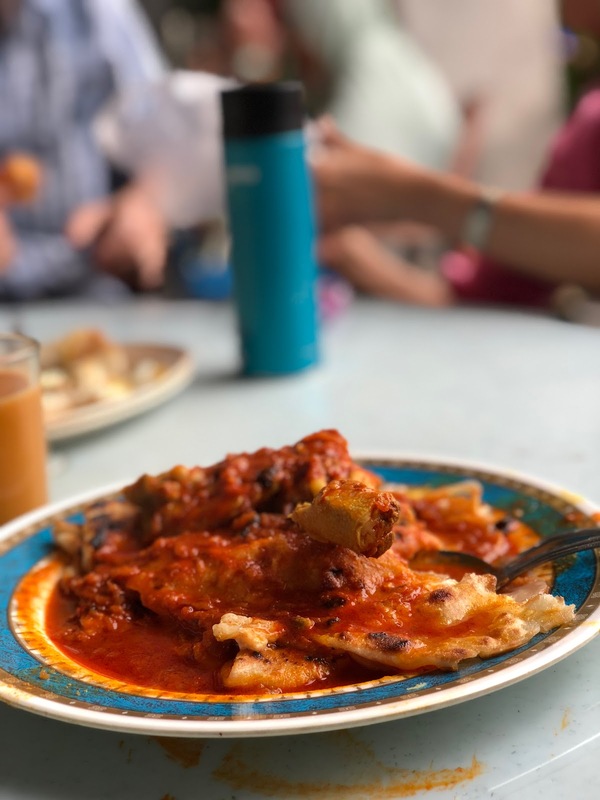 The Kway was thick and smooth, making every mouthful so delicious! Unlike the Duck Kway Chap we usually have at home, the duck meat was cut into small tiny pieces. Together with the organs and intestine, you can get a flavorful bowl full of duck Kway Chap! Top it off with the chili! It won’t disappoint you! This year, it’s the 10th year of George Town being awarded as a UNESCO Heritage site. The joyous occasion is also declared as a public holiday in the state! Why didn’t we declare one in Singapore too? We flew in on 7 July so that we will not miss the mega event that night! Honestly, it’s the best heritage festival I attended! Sorry, Singapore! From the decorations on street to booth, everything was well organized! There were home-cook cuisine to food that gave a nostalgic feeling. As if I’m walking down the streets in 1970. My mom was like “ Look! I played that when i was a kid! You know your uncle was very mischievous and he went to disturb the ..” We end the night with a happy tummy and reminiscing my parent’s childhood. Unlike Pitt Street Koay Teow Soup, Poh Li Duck Koay Teow is located along the street . The street hawker style caught our attention and we saw many people queueing up for it. Although, we were on our way to Yong Pin Dim Sum Restaurant, we decide to stop by for a bowl of duck koay teow. The Koay Teow Soup was light and Koay Teow was smooth and silky! Honestly, the Koay Teow soup is comparable to Pitt Street Koay Teow Soup ! Personally, i still prefer Pitt Street Koay Teow Soup because of the eel fishball. 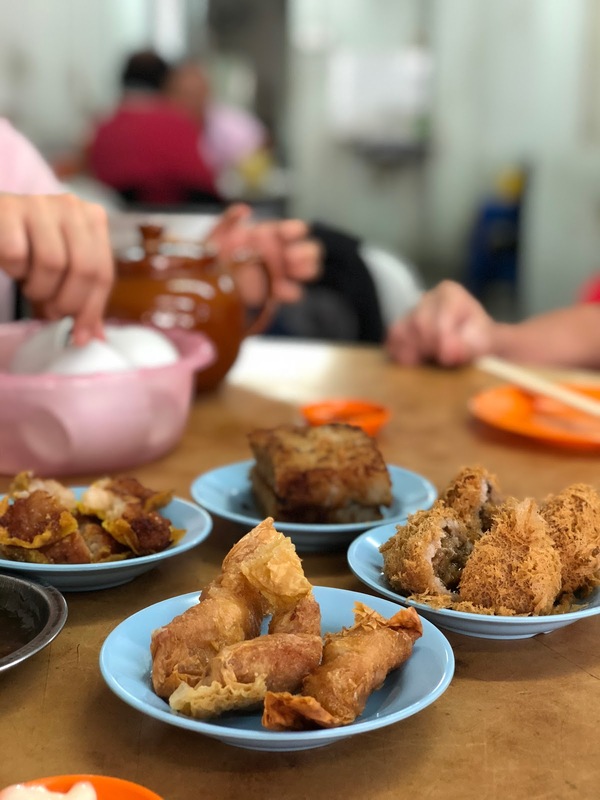 I think one of the best place to enjoy Dim Sum in the world is in Malaysia. They are affordable and delicious! Plus, it’s one of the breakfast style we asian all love! Although we are not like the cantonese who enjoy Dim sum every weekend, my family enjoy having dim sum together in Chinatown. Thus, when we were in Penang, one of the place we want to go to is a Dim Sum Restaurant. H found Yong Pin Dim Sum and it definitely a gem. They have a wide variety of dimsum available and my favourite is Pork Siew Mai! Others are pretty good too! Unlike the usual Dim sum restaurants we visited previously, the waiters are not hostile and impatient. In fact, they are very friendly and nice! Definitely recommend anybody who wants to fix their dim-sum craving there and not squeeze with others! On our way to Pasar Chowsrata, we stop by famous Penang road Teochew Cendol and bought cendol to quench our thirst. The market is well organised, clean and newly renovated. The market is crowded with local as well as tourist. Although the market is not big, you can find various things ranging from groceries to kitchenware. My mom was really excited when she saw a group of people gathered at a Vegetables stall. They were choosing Durian! It’s the season of durian and Penang is famous for its Black Thorn Durian! Thus, my mom bought one! & a huge durian too! Other stuff worth buying is the dried seafood and wu xiang powder for marinating of meat! After a long morning, we went back to our hotel and take a break before meeting our relatives for lunch. This wasn’t on our list but if you are looking for a chinese cantonese restaurant that serves decent food, this might be a good choice. Food is good and reasonably price! I like three kind of egg and steam fish was great too! It was very crowded when we got there! Thus, it is advisable to make a reservation! July is one of the hottest month in penang. Thus we visited the mall after lunch to escape the hot weather. Gurney Plaza is like most mall in Singapore and you can find the big international brands there. You can find mid-range product to the local brands in the mall. Other than fashion, there is a wide range of restaurant to choose from. We didn’t dine there because most of them are restaurant chain and can be found in Johor Baru or even Singapore. If Gurney Plaza is not enough, you might want to head over to the mall next door - Gurney Paragon. In the evening, we visited one of the most expensive Rojak in town. Despite being expensive, the queue at Hock Seng is still long and recommended by many grab driver we met. 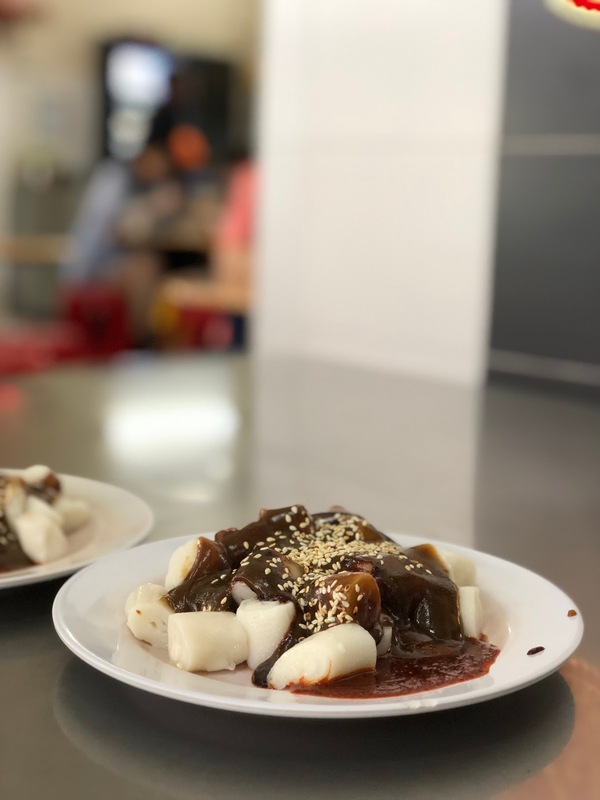 Hock Seng Rojak is unique on its own. The sauce is very gooey and thick compare to the ones we had at home. The sauce is sweet and has a strong shrimp taste. 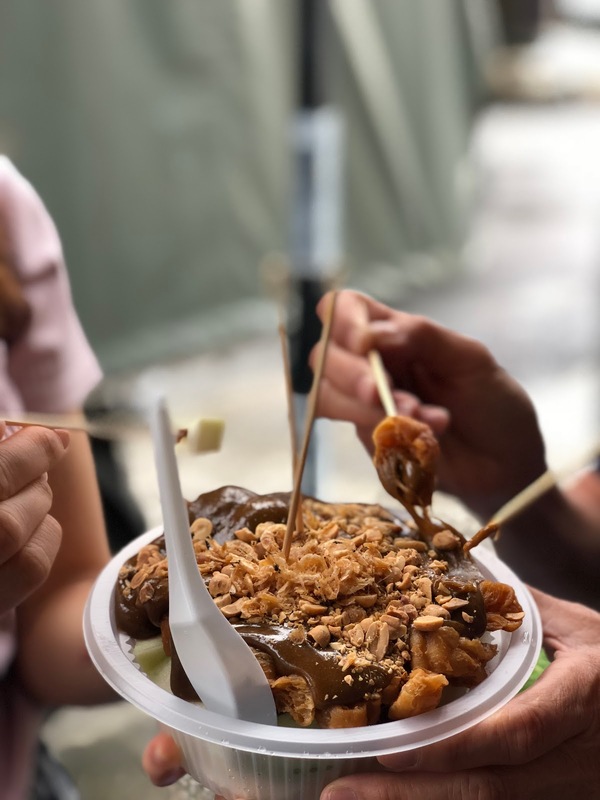 Served with generous peanut on top of fresh fruit, You tiao and Taopok, Hock Seng Rojak is worth a try! We like the sauce and brought one pack home! It was better to buy the sauce home because we could control the amount of sauce to put! It’s a little too sweet! Note: Have it spicy as it will taste better and not overwhelm by the generous amount of sauce! Soon it was dinner time and we brought our parents to our favourite prawn noodle stall! Although we were early, it was pretty crowded there! 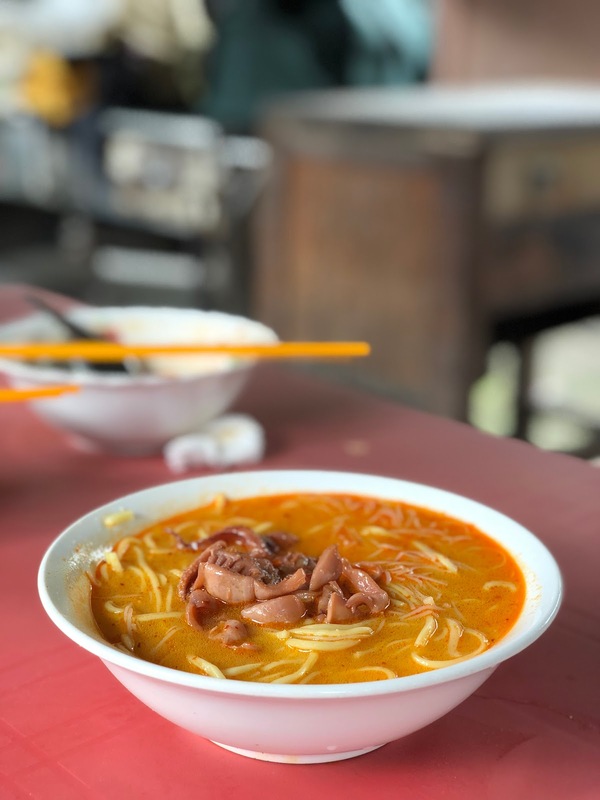 I think i need no introduction with my favourite hokkien prawn noodle because i have mention it multiple times in my favourite food in penang as well as 2017’s 3 Days 2 Night itinerary. 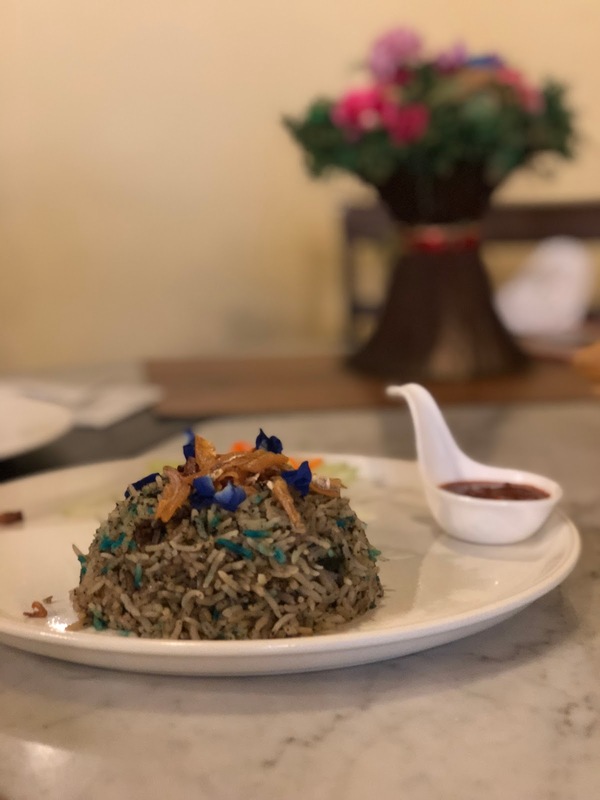 Do note that there are 2 outlet and the one at 67-A, Lebuh Presgrave, George Town, 10300 George Town, Pulau Pinang, Malaysia taste better than the other. So don’t visit the wrong outlet! So, We end the 2nd day with shopping at 1st Avenue Mall & massage at Siam Paradise! We didn’t try Nasi Lemak the previous time so i thought of trying one this round! We visited Ali Nasi Lemak because the stall open the earliest! Located in Sri Weld Food Court, Ali Nasi Lemak serves Nasi Lemak in banana leaves. Although the rice is not as fragrant as the one i had in Johor, the sambal is good! Sweet and spicy! Also, very reasonable price for 1.80 RM that includes rice, half an egg and anchovies. After starting the appetizer right, we visited Genting Cafe - 雲頂餐室 for the famous chee chong fun! Honestly, the Chee Chong fun is really good and very addictive! If i’m not saving space for other food, i can finish 2 plate of this! Other than the Chee Chong fun, we ordered other stuff in coffee shop to try! 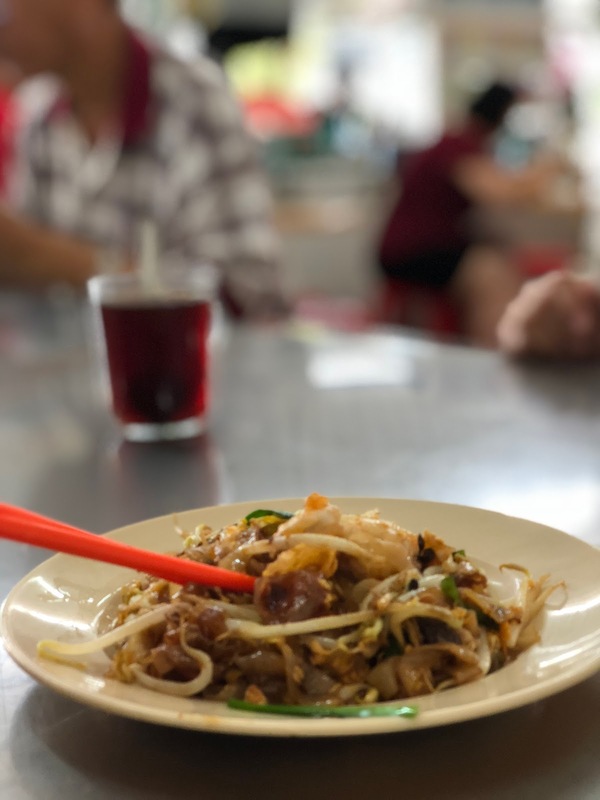 We love the Char Koay Teow and Wanton noodle too! Kek Lok Si Temple is located at Air Itam in Penang and one of the biggest chinese temple in Malaysia. I remember visiting Kek Lok Si temple when i was a kid and we had to walk up the long stairs! When you get to the top, the view is impressive. I think it is even better than Penang Hill! Besides, we visited the temple on a Monday morning and it was very peaceful. There are 2 drop off point in Kek Lok Si Temple. Usually, the driver will drop you at the bottom and you have to take the elevator for 3RM per trip up. I remember the previous time we visited, the driver drop us at the top because he wanted to pray too. Although we are not as lucky, we still enjoy our time there! Other than visiting the temple, one of our objectives to Air Itam is for the food. My parents wanted to try Asam Laksa and we brought them here! I love how refreshing the Pasar Air Itam Asam Laksa is! Definitely one of my favourite food in Penang last year! We were 1 hr before the Sister curry Mee close but minutes away from the last bowl of Curry Mee. Thankfully we manage to secure the last bowl of noodle. Although, the grandma told H that this bowl does not have a lot of ingredient inside,H still purchase. Thankfully he did! The broth was thick, not overly spicy and the mixture of noodle and bee hoon made it even nicer! 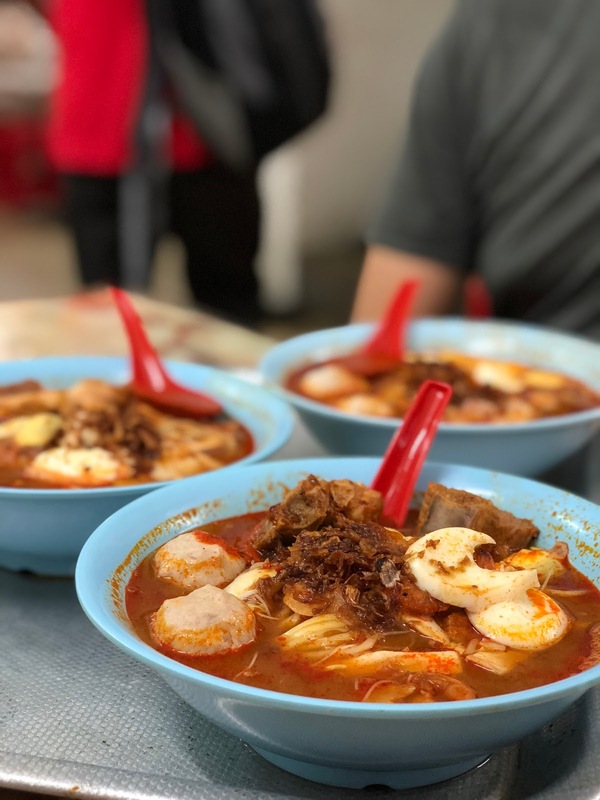 It’s on our list for 2019 Penang food Trip! We went to purchase some traditional biscuit while we were on our way back. Although there are stalls in market selling Him Heang biscuit but they only have 1 main retail outlet in Penang. 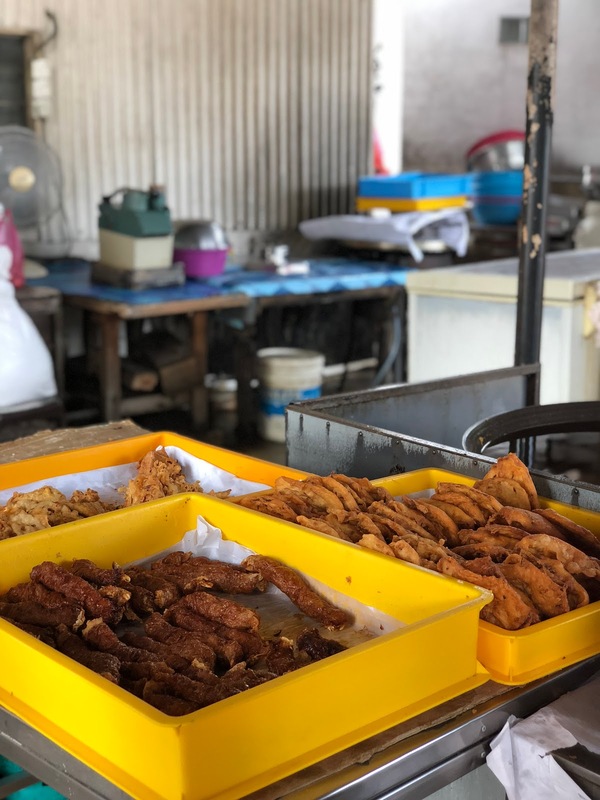 It is arguably one of the best Tau Sa Pia in Penang! One of the reason why my mom prefer this over other brand is because the biscuit remains to be crispy and ‘fresh’ after a few days. Plus, there are not many tourist in the shop! Most people we saw are local who drives in to buy the biscuit. Definitely a place i would recommend you to purchase your gifts to impress your family and friends back home! In the late afternoon, we visited China House for cakes. The place has a very traditional layout of heritage building that is linked by an open air courtyard. It comprises shops, cafes, restaurant, galleries and live music at night. I thought it was very unique and beautiful! To be honest, it was very crowded on a Monday afternoon and we almost couldn’t get any seat. We ordered a couple of drinks and cakes to share and they were surprisingly good. Especially the Caramel Cheesecake! Rich and creamy but not too sweet! After 2 cakes, we decide to order carrot cake to share because it was good! 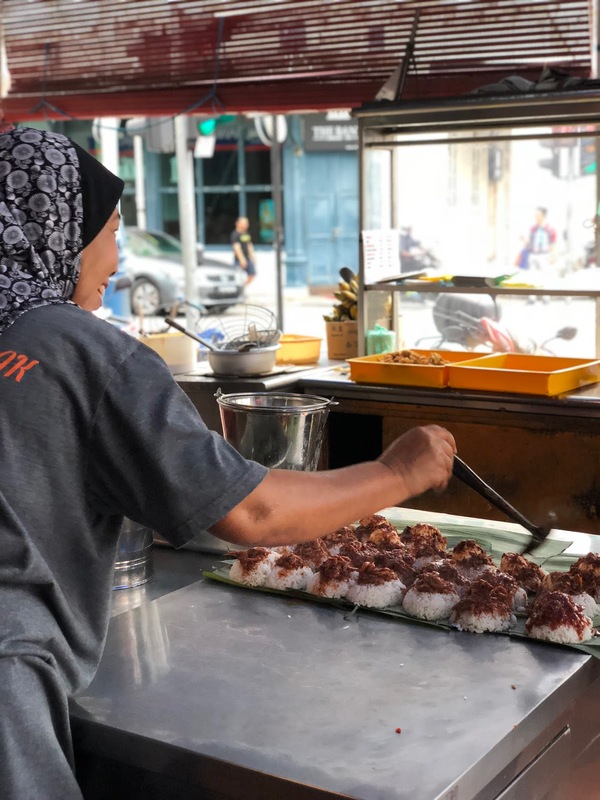 If you are a first-timer to Penang, perhaps you might consider Chew Jetty as there are more shops selling souvenirs and gifts there. Also, the walkway is more secure compared to others. So instead of the overcrowded Chew Jetty, we visited Tan Jetty this time round. Although the bridge at Tan jetty is not as well maintained and can be quite dangerous if you missed a step, it is very peaceful there. We bought Lor bak and picnic there! & the Lor Bak is superb! Crispy and very delicious! Especially the chilli that comes with it! After exploring the street art in George Town, soon it's time for dinner. If you are looking for the best briyani in town, this might be the place! 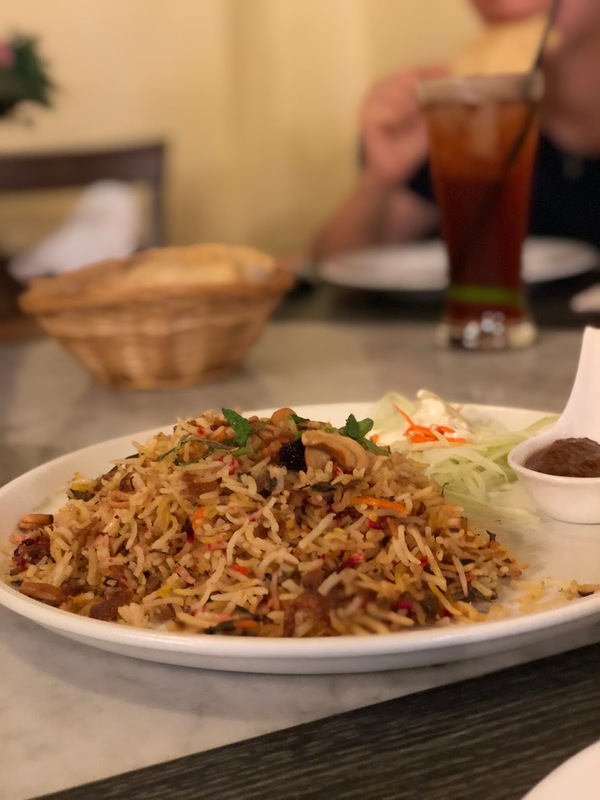 We spent our last dinner in Penang at Jawi House Cafe Gallery. We ordered the Curry chicken Mutton Stew, Curry vegetables, Prawns to share and each dishes did not fail to impress. The chicken is so tender and meat can fall of the bone easily. 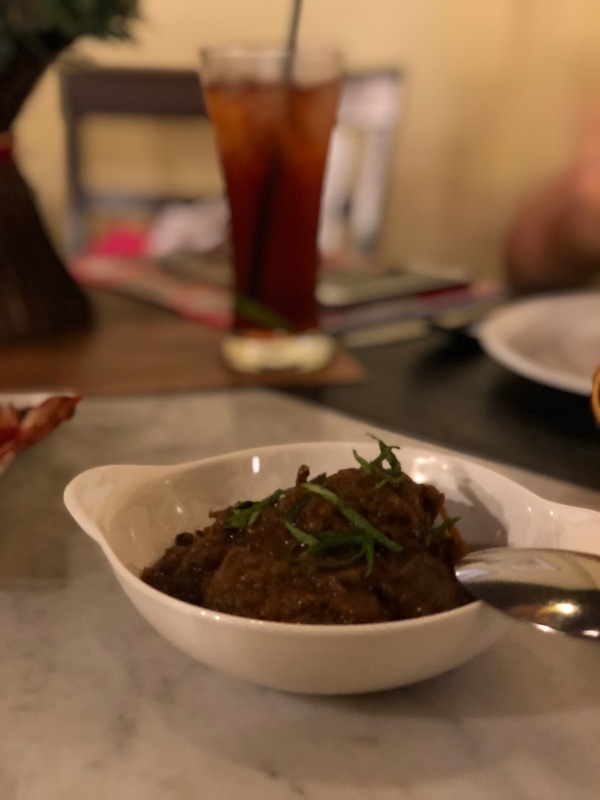 My sis’s favourite got to be the lamb stew that is not too gamey and yet soft and tender .Even the rice is cook to perfection - soft and fragrant! Even the curry vegetables we ordered is flavour and delicious! Although, the portion is quite small but it is sufficient for us because we were not hungry. My Dad is the happiest diner among us! It has been a while since he get to eat authentic Peranakan food! Ok, maybe i should start searching for good authentic malay or peranakan food for my dad in Singapore. Any recommendations?